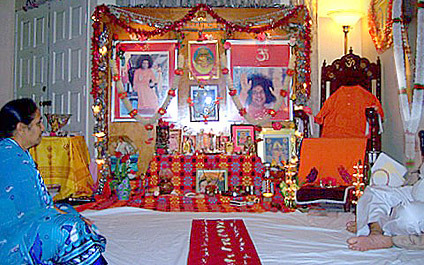 The Sri Sathya Sai Baba Karuna Center at Corona was formed as the result of personal communication, in 1999, from Bhagavan Sathya Sai Baba, Himself. The Center was also given its name by Bhagavan. It was inaugurated on March 26, 2000, by the then Regional President Mr. Robert Bozzanni. This Center is located in the Inland Empire of California – Riverside County. The Karuna Center is active in all three wings of the organization, often partnering with other Organizations to serve those in need in our area. The Karuna Center strives to keep open communication with all its members and provides a loving and welcoming environment to visitors and new members. Service activities at the Karuna Center include devotees making lunch bags at their homes and brought to the Center, on Sundays, to be collected and distributed to the needy on the Santa River riverbed. Devotees also meet at the First Congregational Church of Riverside on Wednesdays and help welcome, cook and serve a sit-down hot dinner to our less fortunate brethren.